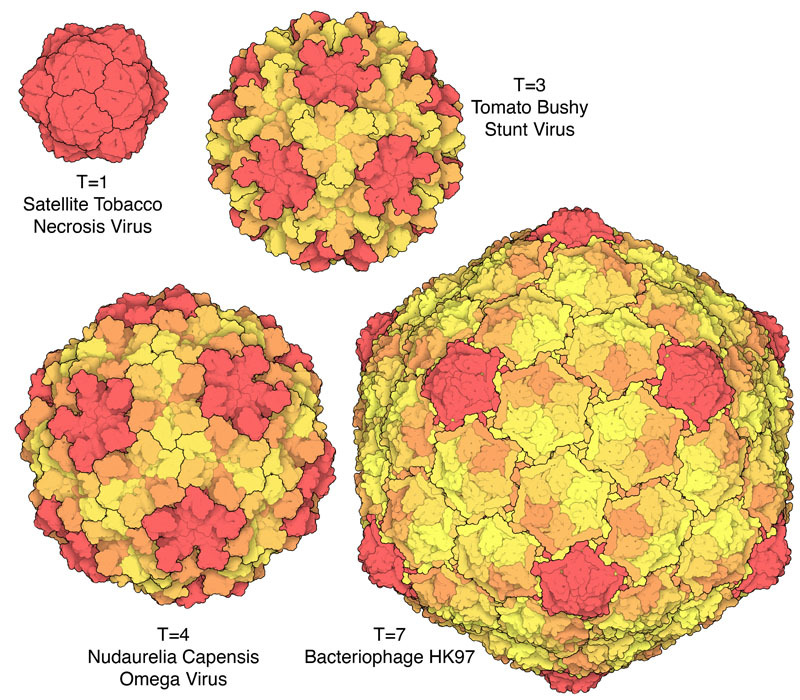 Icosahedral virus capsids. In each virus, all of the subunits are chemically identical, but they adopt a few different quasisymmetrical shapes, each colored differently here. Pentamers of subunits are colored red, and hexamers of subunits are colored in shades of yellow and orange. In the 1950s, before any virus structures had been determined, Watson and Crick predicted that viruses are symmetrical assemblies of many small subunits. They based this proposal on a puzzling observation: only a small amount of RNA (or DNA) can fit inside a tiny virus, but this RNA needs to encode the sequences for the proteins comprising the virus. This problem is particularly severe for the smallest viruses, such as satellite tobacco necrosis virus (shown here from PDB entry 2buk). Its capsid is just big enough to hold a single strand of RNA that encodes only one protein: the capsid subunit. It’s called a “satellite” virus because it can’t infect a cell on its own. Instead, it relies on other viruses, which infect the cell at the same time, to provide the necessary viral machinery for its reproduction. Viruses typically need to be larger than these tiny satellite viruses, so that they can encode additional viral proteins. One way they do this is by using quasisymmetry. In perfectly icosahedral viruses, the subunits form pentamers that assemble at the vertices of a small icosahedron. In quasisymmetrical viruses, a single type of subunit plays several different roles. They form pentamers that assemble at the vertices, but they also assemble in a slightly different way to form hexamers that fill out the faces of larger icosahedrons. In the early 1960s, Caspar and Klug discovered that there are a few systematic ways to arrange these pentamers and hexamers, based on a triangulation number that quantifies the number of slightly different shapes that the subunit needs to adopt in the final capsid. Perfectly symmetrical viruses have a triangulation number T=1, because all of the subunits are identical. In satellite tobacco necrosis virus, this is just big enough to hold an RNA strand 1239 nucleotides long. Tomato bushy stunt virus (PDB entry 2tbv) has the next larger triangulation number, T=3, with pentamers on the vertices of the icosahedron and a hexamer centered on each face. It can hold a larger genome with 4776 nucleotides that encodes five proteins, including a viral replicase. The T=4 capsid of Nudaurelia capensis omega virus (PDB entry 1ohf) has hexamers centered on each edge of the icosahedron, and holds two strands of RNA that encode replicase and capsid proteins. Bacteriophage HK97 (PDB entry 1ohg) has T=7 quasisymmetry, and is large enough to enclose a DNA strand with 39,732 nucleotides that encodes 61 proteins. Exceptions to quasisymmetry, colored similarly to the first illustration. Of course, evolution always comes up with exceptions to every rule, and many variations on this theme have been discovered. 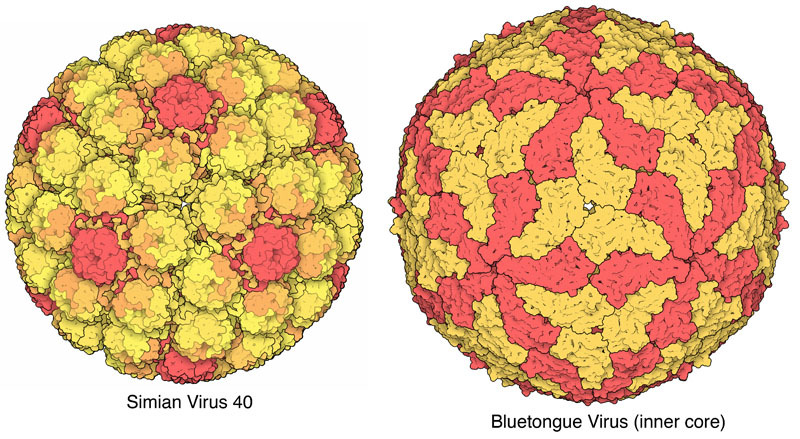 Many icosahedral viruses, such as adenovirus, use several different types of subunits to create a capsid, placing different proteins at the vertices and on the faces. Some viruses, however, use a single type of subunit that doesn’t conform to classic quasisymmetry. For instance, simian virus 40 (PDB entry 1sva) resembles T=7 quasisymmetry, but uses a pentamer in all of the positions. It does this by building long arms on each subunit that intertwine with neighboring subunits. The inner core of bluetongue virus (PDB entry 2btv) has a unique tiling of subunits reminiscent of an Escher print. The subunits adopt two unique types of positions—to see the difference, notice that the pointed end of red subunits cluster at the five-fold vertices, but the same pointed end of each yellow subunit tucks in between two red subunits. Quasisymmetry requires that subunits make small motions to fit into their local environments, so that they can form both pentamers and hexamers. Looking closely at the subunits in tomato bushy stunt virus, we see that they are composed of two domains. One domain (colored bright turquoise or green) forms the pentamer and hexamer contacts, and the other domain (colored blue or yellow-green) connects the hexamers and pentamers to their neighbors. The flexible linkage between these two domains allows them to bend to find their proper partners. To explore these motions in more detail, click on the image for an interactive JSmol. You can build models of these quasisymmetrical viruses and explore the principles of quasisymmetry in a paper folding activity available on PDB-101. You can print out a PDB-101 poster highlighting 200 icosahedral viruses from the PDB archive. Take a look at the Geis Digital Archive to view his early paintings of viruses. 1ohf: C. Helgstrand, S. Munshi, J. E. Johnson & L. Liljas (2004) The refined structure of Nudaurelia capensis omega virus reveals control elements for a T = 4 capsid maturation. Virology 318, 192-203. 1ohg: C. Helgstrand, W. R. Wikoff, R. L. Duda, R. W. Hendrix, J. E. Johnson & L. Liljas (2003) The refined structure of a protein catenane: the Hk97 bacteriophage capsid at 3.44 A resolution. Journal of Molecular Biology 334, 885-899. 2btv: J. M. Grimes, J. N. Burroughs, P. Gouet, J. M. Diprose, R. Malby, S. Zientara, P. P. Mertens & D. I. Stuart (1998) The atomic structure of the bluetongue virus core. Nature 395, 470-478. 1sva: T. Stehle, S. J. Gamblin, Y. Yan & S. C. Harrison (1996) The structure of simian virus 40 refined at 3.1 A resolution. Structure 4, 165-182. 2tbv: P. Hopper, S. C. Harrison & R. T. Sauer (1984) Structure of tomato bushy stunt virus. V. Coat protein sequence determination and its structural implications. Journal of Molecular Biology 117, 701-713. 2buk: T. A. Jones & L. Liljas (1984) Structure of satellite tobacco necrosis virus after crystallographic refinement at 2.5 A resolution. Journal of Molecular Biology 177, 735-767. D. L. D. Caspar & A. Klug (1962) Physical principles in the construction of regular viruses. Cold Spring Harbor Symposium on Quantitative Biology 27, 1-24. F. H. C. Crick & J. D. Watson (1956) Structure of small viruses. Nature 177, 473-475.